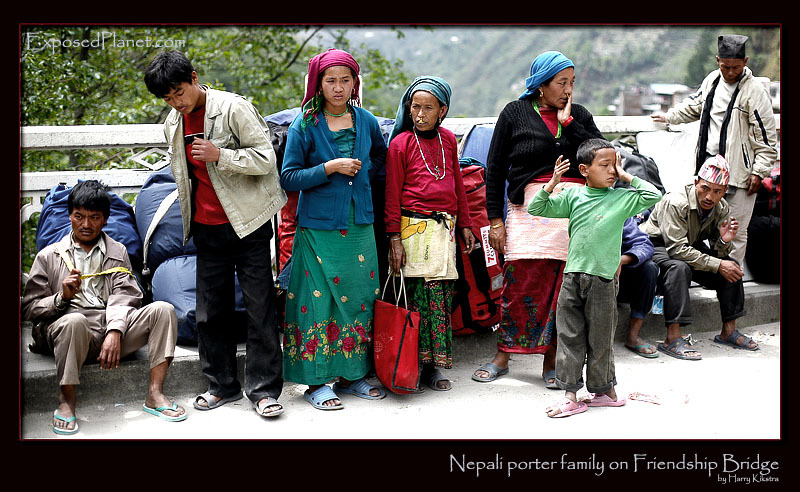 The story behind "Nepali porter family on Friendship Bridge"
It seemed that the entire family was working on the bridge between Tibet/China and Nepal, carrying our expedition equipment over the bridge as no trucks and cars are allowed. Poor as can be, always dressed colorful and beautiful. Why does everybody in the western world look the same when at work? It seemed that the entire family was working on the bridge between Tibet/China and Nepal, carrying our expedition equipment over the bridge as no trucks and cars are allowed. Poor as can be, always dressed colorful and beautiful. Why does everybody in the western world look the same when at work?